Nateasa Scott of Rocky Hill, CT was diagnosed with stage 4 HER 2 Positive Breast Cancer 9 years ago. From that moment on, Nateasa’s only focus was fighting this disease so she could be around to see her children grow. It has been a fighting battle for Nateasa ever since. Despite her illness, Nateasa lives life to the fullest, spending as much time with family and friends as she can. 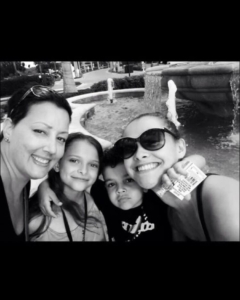 She doesn’t let cancer define her and wants to experience as much as she can with her children. Nateasa wanted the opportunity to spend Treasured Time with Miles, Olivia, and Emma at Universal Studios. Treasured Time granted this “Gift of Moments” in March 2019.